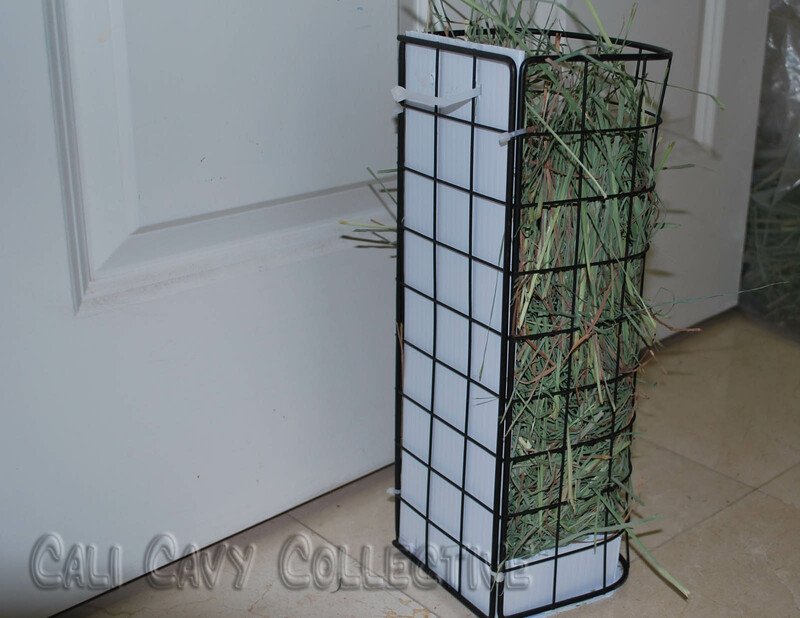 A vertical hay rack is our humans most recent solution to dispensing hay. 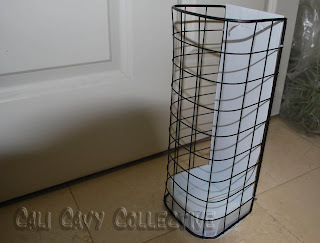 Ours is a simple DIY version made from bent C&C grids, coroplast and zip ties. 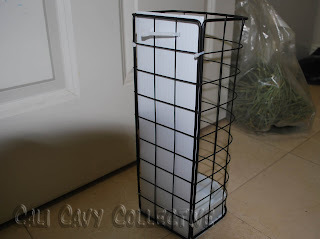 It is secured onto the side of the cage with a large binder clip for easy removal. Whee rather like using vertical hay racks. The one our humans made for us has a coroplast backing and bottom to catch small hay flecks and keep our fleece bedding cleaner. 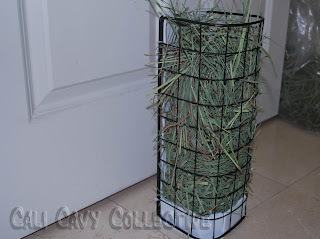 They came up with this idea after seeing the angled hay racks sold at pet stores which they disliked because bits of hay would fall in our eyes. 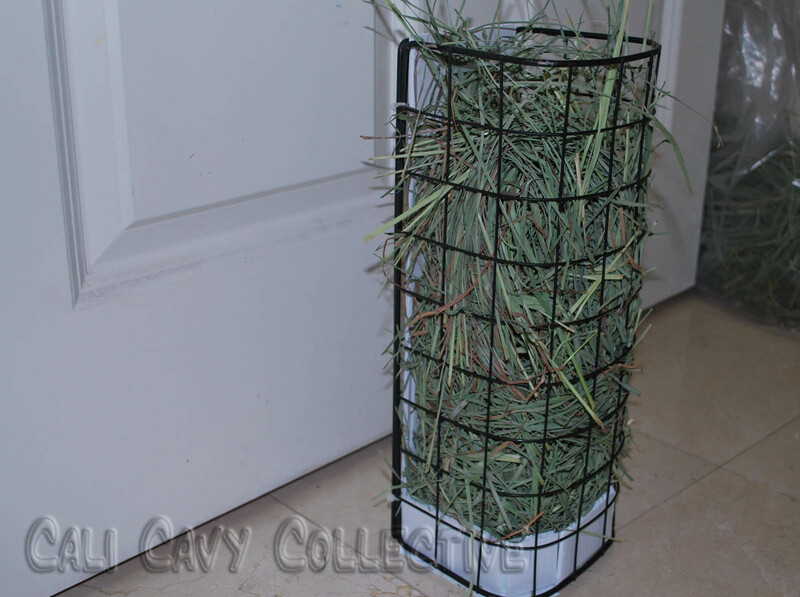 With a vertical hay rack, hay is shoved in through the top so this doesn't happen. 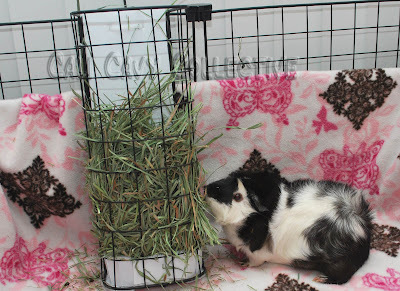 Since it is reasonably good sized it can hold a lot of hay at once for your piggy to eat. 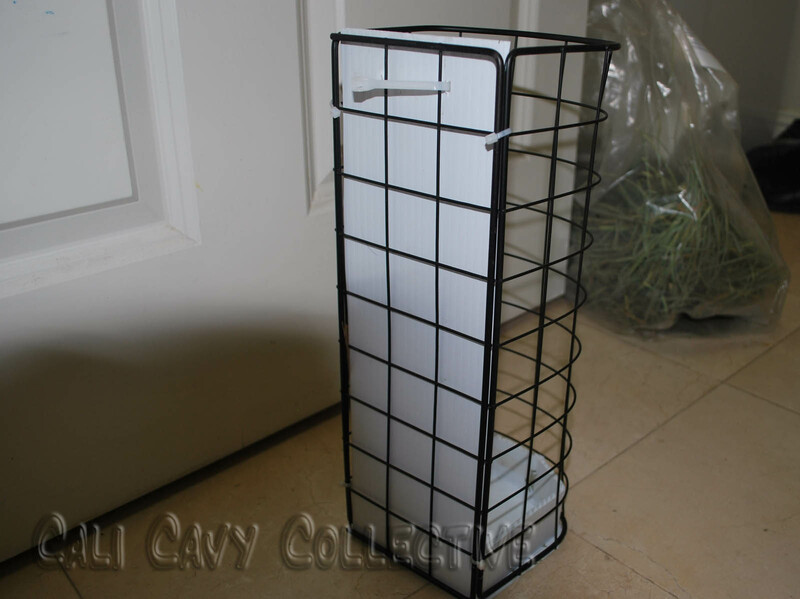 We can choose to eat from the bottom, or put our paws on the sides of the rack and climb it to reach choice strands. An extra bonus is that this encourages more exercise. Best of all, it keeps us from going potty in the hay so there is no icky odor. Of course, the vertical hay rack may not be ideally suited for all piggies - lazier guinea pigs might not be motivated to climb or eat from it, we assume this is also true for sickly pigs. 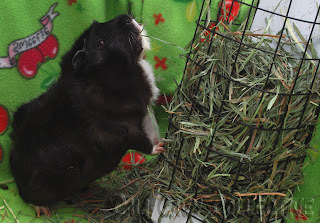 It is possible that elderly pigs might not appreciate the extra effort involved to reach the hay. 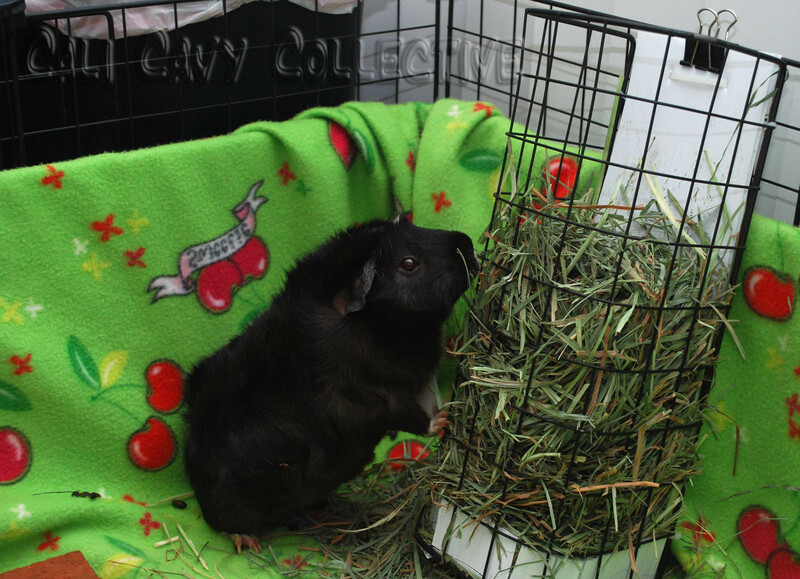 Also, some adventurous pigs could decide to knock down their hay rack - Belka loves to shove it aside and hide behind it, while Revy enjoys tipping it on its side. So far, we have found that vertical hay racks are the solution that works best for us. 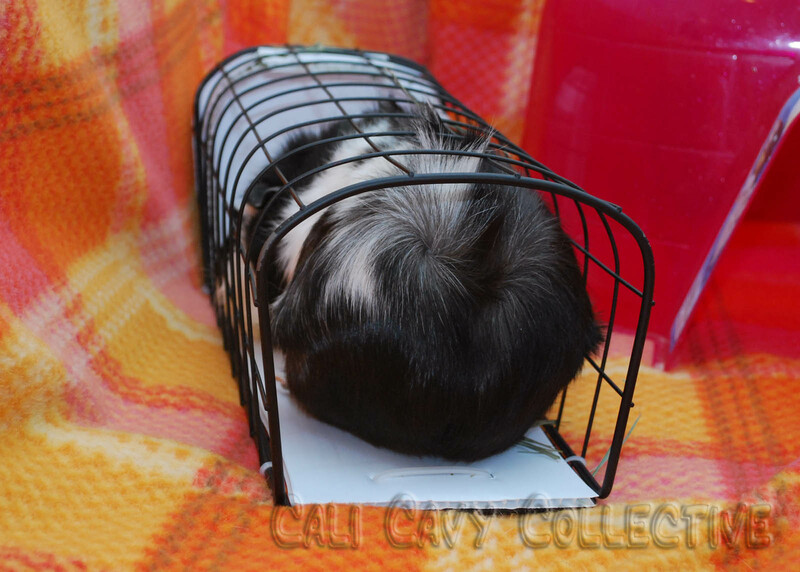 Whether you decide this method is best for your piggy though is entirely up to you! Piggies aren't supposed to go in the hay rack! btw, slave really likes your report and is wondering I you would mind posting this to the Undercover guinea pigs blog as well? Whee can verify firsthand that our hay is indeed very tasty, our humans order it fresh in bulk directly from KMS Hayloft for us. We are unsure if it is available in the UK but we also think that Oxbow hay is good quality as well. Good luck on finding some! Sure feel free to post it to Undercover Piggies! You can click on the pigtures to enlarge them to full size, or if you need anything let us know so we can order our slave to email it to you. 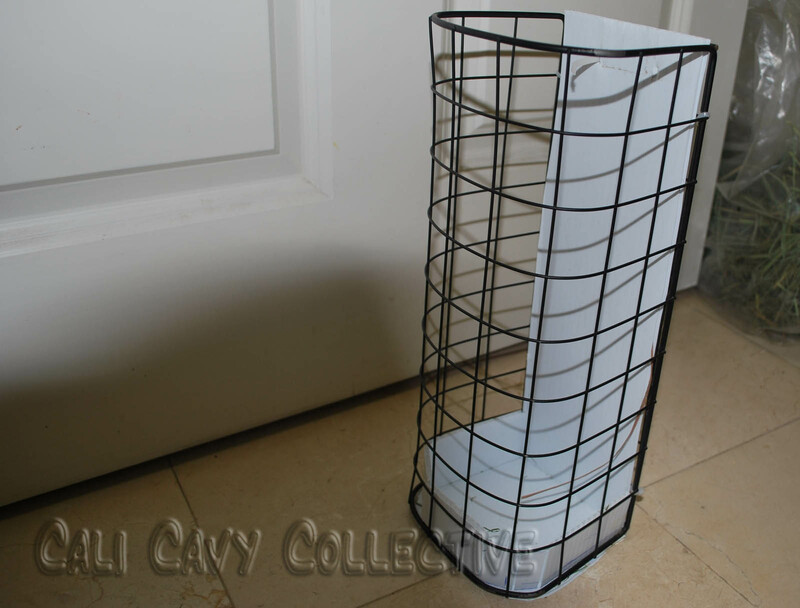 Hi, I use large round kitchen utensil holders, and caribiner clip them to the cage. I got mine for about $5 from WalMart. Great minds think alike, but I'm just too lazy to make mine.